When I started making scrolls, I used the ductus in my calligraphy books for whichever script I needed. As I got more and more comfortable with each of the scripts, I wanted to expand my knowledge and skill by attempting to replicate period scribes' hands. I would suggest trying this after you have some experience with a few different scripts, and working at a few different sizes. It helps to be comfortable with the pen and forming letter shapes that you can figure out how to make the letters on your own. That said, it can also be a good exercise to train your eye and hand by spending quality time with period calligraphy. You want the highest quality version of the original you can get to start. I like digital best, as you can zoom in very close, and adjust the contrast and brightness of the image if needed. 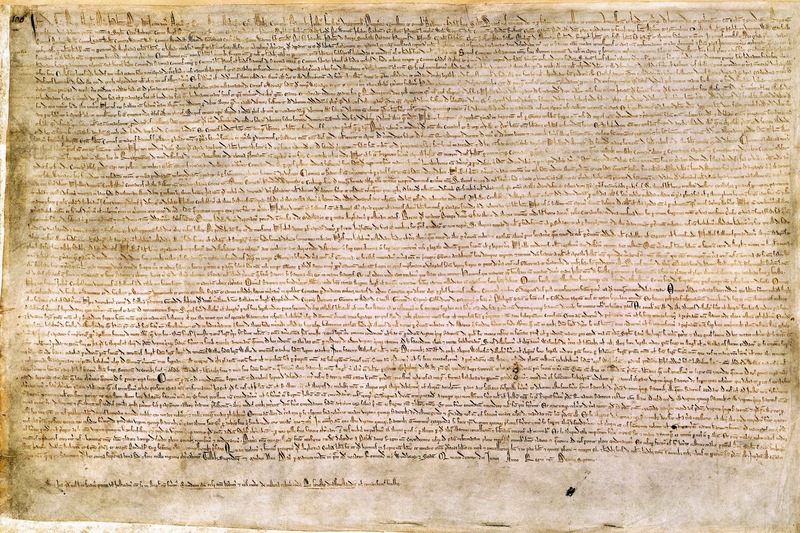 For my examples in this post, I'm using a contrast adjusted version of the Magna Carta as inspiration, taken from Wikipedia. I was trying to learn this hand for the making of the Serjeanty for Master Phillip Reed. If the final piece has illumination done by a different artist, work with them to make sure the hand you choose goes with the illumination style of the finished piece. I'm fortunate to work with many illuminators who know my interests, and they provide me with a specific example that includes calligraphy they are using as inspiration. This is probably easiest to do with a printout of the original. It's possible to do it digitally within an image editing program on your computer, but you need to be able to measure parts of the image, including measuring at an angle. Use what works for you, including holding a ruler up to your computer screen - just don't change zoom levels between measurements! (Above) First, I measure to determine nib-width using a printout of the period example, enlarged as much as possible. Measure at the angle the nib was used, on the widest part of a normal stroke. Measuring multiple strokes, I get a result of 1/32" for the nib width. (Not shown) By contrast, the ascenders of the lowercase d are as wide as 2/32"... This is an example of a stroke where extra pressure was used and the tines of the scribe's quill spread apart creating a wider line. This technique is usually only used in ascenders or descenders or for accents on specific letters or strokes. Be careful when trying to measure nib width that you can tell the difference. The bowls of rounded lowercase letters are often a good place to start. (Above) Next, I measure to determine minim height. There were some small variations, but I measured 4/32". Since the nib width is 1/32", minim height is 4 nib widths. (Above) Finally, I measure the space between lines. They varied from 10/32" (shown here) to as much as 13/32". The AMES lettering guide has built in ratios of 2:3. 3:5 and 1:1 (which can be used to make 1:2, 1:3, 1:4, etc.). With a minim height of 4/32" and the line spacing of 10/32" through 13/32", the ratio of minim height to line height is from 1:2.5 to just over 1:3 - that's a lot of space between lines! 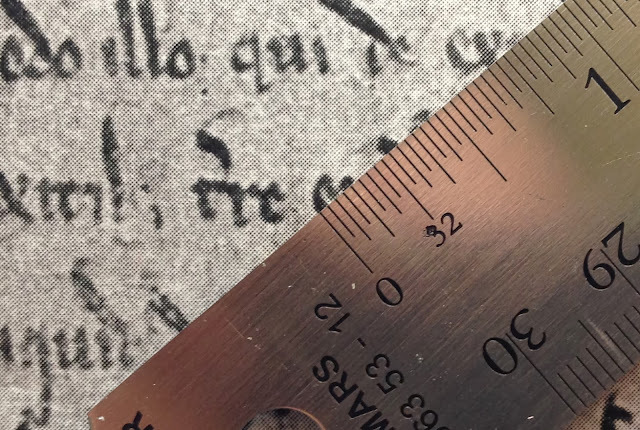 (Not shown) Measuring the ascender heights shows that they rise an average of between 6/32" to 8/32" above the top of the minims. That's 1.5 to 2 minim heights. As you gain experience, you'll learn to eyeball these ratios. You can always practice & make adjustments to fine-tune the appearance of your hand, regardless of if you measure or eyeball the ratios. Using the measurements, it's time line a page to practice on. I decided on a 1:3 ratio for minim height to white space. My guidelines use the 1:1 spacing on the AMES guide. Instead of trying to count holes in a pattern of 1, 3, 1, 3, etc., I lined every hole and put a pencil mark at the start of every 4th space to mark where my text will go. The "extra" guidelines in the whitespace will help me be consistent with the height of my ascenders and descenders. Pick a pen/nib and write a 4 nib width height reference. Adjust the AMES guide 1:1 scale to match this height. Finding the height of four nib widths of a Rotring 1.1mm ArtPen. The 1:1 scale seems to match a 9 on the AMES lettering guide. Find a clear section of the original, and attempt to copy it onto your practice page, mimicking the period letter forms and spacing as accurately as you can. This allows you to get used to the hand while giving you the ability to directly compare your work against the original. After the practice section is complete, examine it to see if you need to adjust your nib width or guidelines. If the letters are too thin and tall looking, try switching to a slightly larger nib. If the space between lines is too much, line a new section with less space, etc. Keep adjusting and practicing until you are happy with the results. This process really forces you to get a feel for every detail of the period hand, including forming the letters, spacing within and between words, flourishes, etc. I find that if I don't pay close attention while doing this, I will automatically revert to the "basic" letterforms I'm already familiar with. How do I think I did? Overall, not bad. I'm pretty happy with my letterforms and spacing inside the words. My spacing between words is a bit tight, especially on the first line. My ascender height is a little tall compared to my minim height. Stylistically, I like it, but it doesn't match the original as well as it could. My minim height might be slightly tall. It's subtle, but I think 3.5 nib widths might be a little closer to the original letter height. This is difficult to judge because the original work seems to vary a bit from letter to letter. The space between lines of text is also slightly large. Adjusting the AMES guide will shorten both the minim height and line spacing. Despite my complaints, I feel I learned the hand well enough that I could work on a final piece at this stage. If I were staying with this pen, I'd practice with a slightly smaller spacing on the AMES guide to see how that changed things before making a reference and working on the final piece. However, I'm not as happy with the feel of the results as I'd like. The Rotring cartridge pen isn't right pen for this job: it is very stiff, and I can't get the wider than normal strokes on the lowercase d's that stand out so well in the period example. If I had to stick with this pen, I'd might make two strokes side by side on the d's to mimic the appearance of the tines of the quill pen opening up. This nib is much more flexible, and I was able to get the wide strokes on the d's that I wanted. This time, my spacing between words was a little too much in some places. Letter forms look a little better to me, partially due to the more flexible nib that also produces finer thin lines. The space between lines still looks like it's just slightly too much, perhaps a nib width or two taller than it should be. Penciling guides in 1:2.5 (2:5) or 1:2.75 (4:11) ratios would be difficult with the AMES guide, so for the final piece I chose to stay with 1:3. The ascenders & line spacing are a little taller than in other examples of this script. Note also how most ascenders are strictly vertical. Some examples of Carolingian miniscule have a very slight lean to the letters, but not this one. The ascender of the lowercase d is slightly wider than the normal nib width (probably from pressure spreading the tines on the quill pen), and is at an eye-catching 45 degree angle instead of vertical. When you look at the page from far away, these strokes really stand out in the text due to the angle and weight. The lowercase w is similarly striking with its parallel strokes, but at a steeper vertical angle than the d. Since w isn't as common in the period text, it doesn't stand out as much. The lowercase a crests above all the other minims. This scribe made his a's just a little taller than the other lowercase letters. The example word shows two variants of the lowercase a, as well as both the standard and half r forms. The uppercase letters have very unique flourishes to them, most containing multiple parallel vertical or horizontal accent strokes. The first line of text also has ascenders that are at least twice as tall as in the rest of the text. Having taken note of the differences, incorporate the unique features and letter forms into practice of the chosen script until you are comfortable with them and they look right to you. I highly recommend making an alphabet quick reference before you work on the final piece. Search the period text for examples of each letter form and copy them down. I keep this just above my final piece as I work on it. I usually work with a dip nib, and if I stop to scan the original for how to make a specific letter, the ink will dry out in the nib. Note that you may see multiple versions of individual letters in the original. In addition to the two versions of the letter a and r identified above in the images, look for the long and short s, if you don't want to use the long s (because it is harder to read and your recipient might not appreciate it), look for the short s at the ends of words and use it everywhere. Depending on the language of the original, it may be difficult to find examples of j, k, x or z. If these letters are used in your final text, you'll need to find versions that work. I usually start with the basic version of the script in my calligraphy books and adjust from there to match the style of the original. Even if you don't you don't want to put this amount of effort into every scroll you pen, there are some benefits to trying it out at least few times. Calligraphy books typically only show you the author's ductus for each script. They are interpreting multiple period sources to come up with their letter forms. They often choose leave out the more interesting or unique flourishes to focus on the basic letter forms that are most commonly used by many different scribes. It's a great place to start, but it can also be fairly "generic" as the goal of the books is usually to represent the essence of a particular script, and not explore the many variations it had in period. By studying the differences of a script as it was penned by different period scribes, you'll learn different ways of shaping the letters, and the different artistic flourishes each scribe used to make a hand of their own from that script. You may also start to see how the hands changed from master to apprentice, over time, or from region to region. By incorporating a few flourishes from the examples you study you can develop your own hand: a version of a particular script that is recognizably yours. Chances are you'll end up doing this to some extent anyway, so why not be conscious of what you are doing and study the period masters for inspiration?